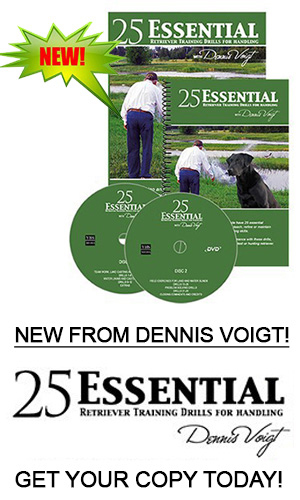 This brand new DVD and Field Guide are now available from YBSmedia.com. The DVDs have four hours of instruction and there is a 70-page Field Guide included. The Field Guide is a companion to the Drills on the DVD and it has the purpose, procedure, diagrams, photos, tips and key notes for each drill. You can use it in the field or at home as a reference and planning guide. The drills are designed for field trial, hunt test and hunting dogs. All working retrievers will benefit from teaching, refining and maintaining the fundamental skills. Although the focus is on handling, the drills and exercises can help develop marking skills with advanced as well with younger dogs. That is because the teamwork skills, the go straight – the fight the factors lessons that you will see – are also very important to improving marking. Virtually every advanced dog will need some of these drills or exercises to refine or maintain certain skills. A few of the drills are quite structured and involve specific procedures and considerable repetition. Others are more flexible. I use the original names for these drills and give credit to their source. I have always been bothered by certain products on the market that describe some of these drills with different names than the originator. More confusing is that you may encounter totally different drills with the same name. So beware of that. Many of these drills can be done by yourself training alone. In fact, 90% of my drills can be done alone. Other work requires one or more helpers. Some even use another dog and handler. On DVD 1, I start with basic obedience and drills that focus on teamwork and communication at the line. These are followed by drills for land lining or casting skills. They teach essential skills that you need whether you are at a field trial, a hunt test or hunting. The next group of drills focuses on water handling drills. The two most important drills that enhance both lining and casting skills around water are Tune-up drills and Chinese drills. Both were originally developed by Rex Carr of California. The design of each and how you run them is quite different and it’s important to understand them. Both could also be run on land but they are most valuable on water to advance your dog. Since the purpose of each is different, you have to learn two distinct lessons. First is “How to set them up” and second is “How to run them”. In this section you will find three different Tune-ups: a simple one, an advanced one and a swim-by tune-up. You will also find two Chinese drills. At the end of DVD 1, I have three Extras. One is on Warm up and Cool Down. Another is my philosophy and approach to determining what level to work a dog. I also have a long discussion about improving Blinds in the field. I talk about moving from early transition work of drills and repetitious pattern blinds to cold blinds. This is one of the biggest challenges facing some retriever trainers. For the dog just starting cold blinds and struggling, I strongly recommend my 3 X 3 Method. It involves sets of three blinds that are either “Walk-arounds,” “Repeats” or “Cold Blinds.” A set of three cold blinds are just that – three blinds never done before from one line – at first fairly factor free and wide. Secondly, the repeats are one of these sets of three cold blinds done later, perhaps 2-3 days to weeks later. The walk-arounds are described in the video. Mix these three walk-arounds with three colds and three repeats over a period of months and watch your dog develop. DVD 2 starts with Field exercises and shows those that really work. Even advanced dogs that have done many cold blinds often need structured field exercises to improve their performance. The DVD shows various 3-peats, as well as advanced blinds for advanced dogs. This is followed by drills that address problem solving. Certain drills are best used only when a problem arises. Invariably all dogs, at some point, develop a behaviour that hinders further progress. That is the definition of a “problem.” The problem solving drills are designed to solve specific problems and don’t need to be done until needed. For the most part, these drills are like “going back to the yard so that your dog learns the proper way again.” Then, you take your dog to the field and generalize the new behaviour under different circumstances. The Over Into the Water drill teaches a fundamental skill of casting into the water. It is in the Problem Solving section because it’s a good drill to deal with a dog that cheats at trials or is avoiding water entries on overs. You can also do a Cast Off of a Point Tune-up or 3-peat. It is shown in the field exercises section. Both are time well spent so have a look at them. The Sidebar shows a list of the 25 drills. I recommend that you watch the entire video first and get an overview of what is there and the approach to take for drills. Then you can determine which will be best suited to your dog(s). I should note that these drills assume that your dog is through Basics and thus you have the fundamental tools for Transition and Advanced work. 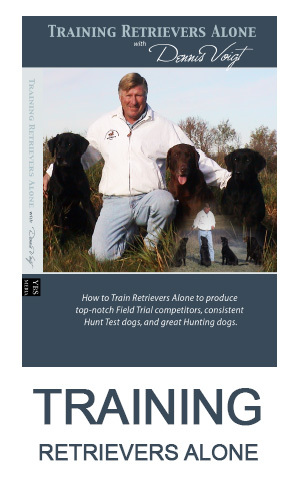 This DVD is compatible with the Total Retriever Training program by Mike Lardy. That is the primary program I use but several others including Stawski, Graham, Farmer and Aycock and Hillmann programs could be used for Basics. I incorporate elements of many of them. The 2 DVD set and 70-page Field Guide are sold exclusively at www.ybsmedia.com with secure online purchase or by phone orders. The package retails for $99.95 which includes s/h in the US.